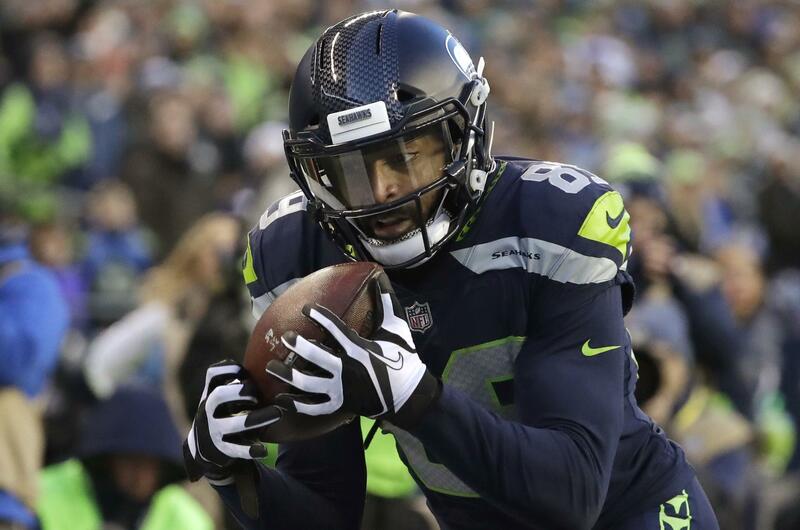 RENTON, Wash. – Seattle Seahawks wide receiver Doug Baldwin was conspicuously absent on Thursday a couple of days after it was revealed that he will be out for a few weeks to treat/rest a sore knee. Friday, Baldwin was back with the knee still in a sleeve. Coach Pete Carroll said Friday that Baldwin was away for a little while getting his treatment plan set up (whether Baldwin may also have received a Regenokine treatment that other Seahawks have in the past, he wouldn’t say). Baldwin isn’t likely to see any time in the preseason. But Carroll said there is no worry he won’t be ready for Sept. 9 and the regular season opener at Denver. “None,’’ he said when asked if there is any concern about Baldwin’s availability for that game. Taking advantage the last couple of days has been 2017 third-round pick Amara Darboh, who had a good day on Wednesday and again on Friday with a leaping, hanging-in-the-air catch of a Russell Wilson pass over Byron Maxwell. Darboh’s status as a third-round pick won’t hurt him in getting a long leash to show what he can do. As of today, if you had to pick six receivers to make the final roster, he’d probably be on it, along with Baldwin, Tyler Lockett, Jaron Brown, Brandon Marshall and Marcus Johnson. Marshall obviously remains the wild card with his health going a long way toward making that decision. Marshall didn’t do a whole lot Friday, but Carroll said the hope is he will soon be full go. Published: Aug. 3, 2018, 5:24 p.m. Updated: Aug. 3, 2018, 5:43 p.m.